I've been intrigued with online sequencing for a while. Wayne and Mark have each developed a nice rhythm to their Tumblrs, with each new image generally playing off some character of the previous one. Recently they've taken it one step further by comparing the random Tumblr feeds coming through their dashboards. 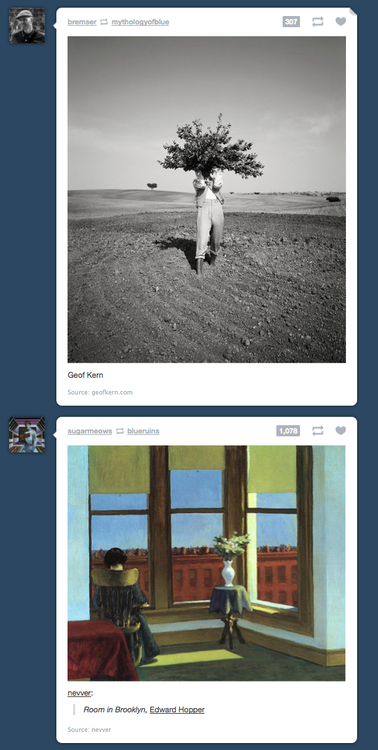 I don't know how many Tumblrs these guys follow but I suspect it's a large number, so it's pretty awesome when images find themselves near similar neighbors just by chance. For example, here's how an Adeline Mai image of two naked lovers was sequenced recently in Wayne's dashboard, followed by a Thomas Eakins photo via Fette. And here's the same image shown on Mark's dashboard. 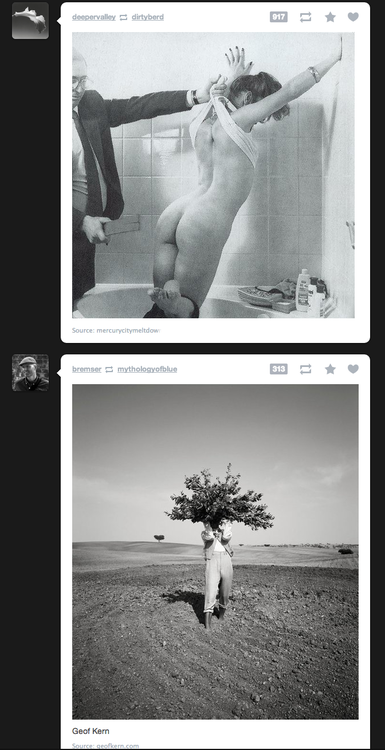 A few days later a Geoff Kern photo appeared on Wayne's Tumblr (unconsciously reblogged by him), mysteriously preceded by an identically shaped mushroom cloud. Here's the same photo on Mark's dashboard. Nice. Finally here's the Kern image on Noah Kalina's dashboard. What's the significance? Possibly none. As one can see from these examples there's a lot of cross pollination and reblogging between Mark and Wayne. So perhaps certain themes are in the air at certain times, and sequences naturally follow. Some of it too might be attributed to the law of large numbers. If you throw enough images together into one giant thread, some interesting sequences are bound to turn up. Both of these explanations may be true but I prefer another: Sometimes the world spits out chunks of pure serendipity. And when that happens you've got to be paying attention. 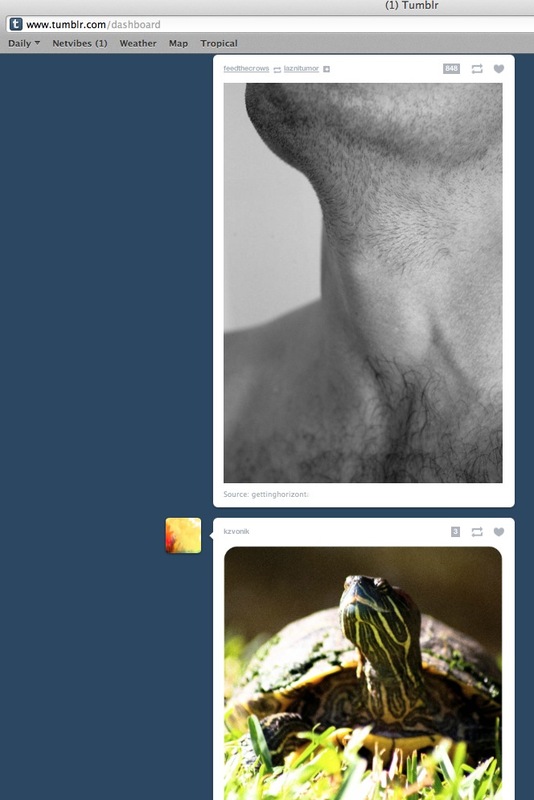 What's on your Tumblr dashboard? If you find a serendipitous sequence along the lines of the ones shown above I'd love to see it. Take a screen shot and send it along. If I get enough I'll put them in a future post.